Protesters in San Antonio pray during a Rally For Our Children event to protest the Trump administration's "zero-tolerance" immigration policy. The group of Democrats, led by New York Rep. Jerry Nadler, live-tweeted their drama as they were stuck in the lobby of the Immigration and Customs Enforcement detention facility in Elizabeth, N.J., trying to get in to speak with detainees. "After having to deal with local PD. After banging on the door and making it clear that we WILL NOT MOVE until we're allowed in, ICE is finally granting us access to see individuals who have been separated from their families," tweeted Rep. Carolyn Maloney, who represents New York's 12th District. Protesters gathered outside as the lawmakers made their way into the facility, only to be greeted by detention officials who seemed to be caught off guard by the visit. "They are asking us to wait 45 [minutes] for the director to arrive — despite permissions from detainees and attorneys," tweeted Rep. Nadler. "Detention center employees have covered the window with paper to block our view," said New Jersey Rep. Bill Pascrell. "We are still being denied access." Around 11 a.m., the lawmakers finally made their way into the facility. "What we saw here today was heartbreaking. Parents are being held prisoner inside, literally crying to us to be reunited with their families," the lawmakers said, in a statement, after the visit. "Trump and Sessions say they are following laws. That is a lie. There are no laws requiring families to be ripped apart. "Trump claims Democrats are to blame for families being broken up. That is a lie. Republicans control every branch of government. Democrats are being forced to get creative in protesting the Trump Administration's new "zero tolerance" stance toward immigration, as they are outnumbered legislatively in the House. Republicans announced that they planned to vote next week on a pair of immigration bills, but Democrats have indicated they are solidly opposed to both of those proposals. "If you cross this border unlawfully, then we will prosecute you. It's that simple," said Sessions. "If you smuggle illegal aliens across our border, then we will prosecute you. If you are smuggling a child, then we will prosecute you and that child will be separated from you as required by law. If you don't like that, then don't smuggle children over our border." Under the new policy, DHS says about 2,000 minors were separated from their "alleged adult guardians" between mid-April and the end of May, although Sen. Susan Collins, R-Maine, said Sunday that the number "may well be higher" than that. "What the administration has decided to do is to separate children from their parents to try to send a message that if you cross the border with children, your children are going to be ripped away from you," Collins said, on CBS' Face The Nation. "That's traumatizing to the children who are innocent victims, and it is contrary to our values in this country." An anonymous White House official told The Washington Post this week that Trump is hoping to use the harsh policy as leverage to force Democrats to cave to his other immigration demands, like funding a border wall and lessening the amount of people allowed to immigrate to the U.S. legally. But senior White House adviser Kellyanne Conway pushed back on that notion Sunday. "I certainly don't want anybody to use these kids as leverage," she said on NBC's Meet The Press. "Nobody likes seeing babies ripped from their mothers' arms, from their mothers' wombs, frankly, but we have to make sure that DHS' laws are understood through the soundbite culture that we live in." Similarly, First Lady Melania Trump released a statement saying "she believes we need to be a country that follows all laws, but also a country that governs with heart." 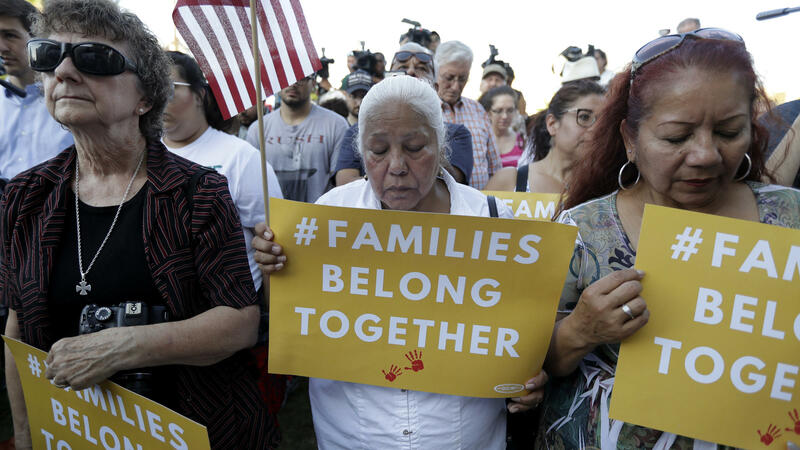 Despite the family separation issue being a decision made by the Trump administration, officials have falsely sought to cast it as a Democrat-created dilemma. "If the Democrats are serious, and if a lot of Republicans are serious, they'll come together. They won't just talk about just this week, just the Dreamers, or just the wall, or just catch and release. It's all of the above," Conway said. On Saturday, Trump was more direct: "Democrats can fix their forced family breakup at the Border by working with Republicans on new legislation, for a change!" he tweeted. But other members of the administration who have had a central role in immigration policy embraced the decision to separate families. "It was a simple decision by the administration to have a zero tolerance policy for illegal entry, period. The message is that no one is exempt from immigration law," said White House adviser Stephen Miller in an interview published Saturday in The New York Times. When the family separation policy was announced last month, White House chief of staff John Kelly told NPR, "They're not bad people. They're coming here for a reason. And I sympathize with the reason. But the laws are the laws. But a big name of the game is deterrence."